Probably the least talked about team in the NBA, but that’s probably just how the San Antonio Spurs like it. The spurs rode the back of their perennial All-star Tim Duncan, who poured in 27 points going 4-5 on his shots in the final quarter to help the spurs overcome a 10 point deficit.The Spurs held Dallas to one field goal in the final seven minutes to rally for a 90-85 win Sunday in Game 1 of their first-round playoff series. San Antonio won despite going 3 for 17 on 3-pointers and getting only 23 points from its normally productive bench. Tony Parker scored 21 points, and Manu Ginobili added 17. Kawhi Leonard had 11 points and 10 rebounds and Tiago Splitter pulled down 11 rebounds for top-seeded San Antonio, which has won 10 straight against Dallas. Devin Harris scored 19 points for the Mavericks, who nearly pulled off a huge upset. Dirk Nowitzki, who finished with 11 points, was 2 for 6 from the field in the final quarter. The veteran forward was closely defended by San Antonio center Thiago Splitter. These two teams face each other again Wednesday night. 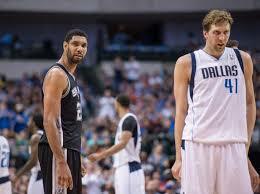 The Mavericks have proven they can hang with the playoff tested Spurs by the looks of game one. Ultimately i think the spurs will win but better games are to be expected from Nowitzki and that the mavs will adjust after letting game one slip out of their hands.